We’re sorry, but there are currently no paid vacancies available with us. Please check back later. 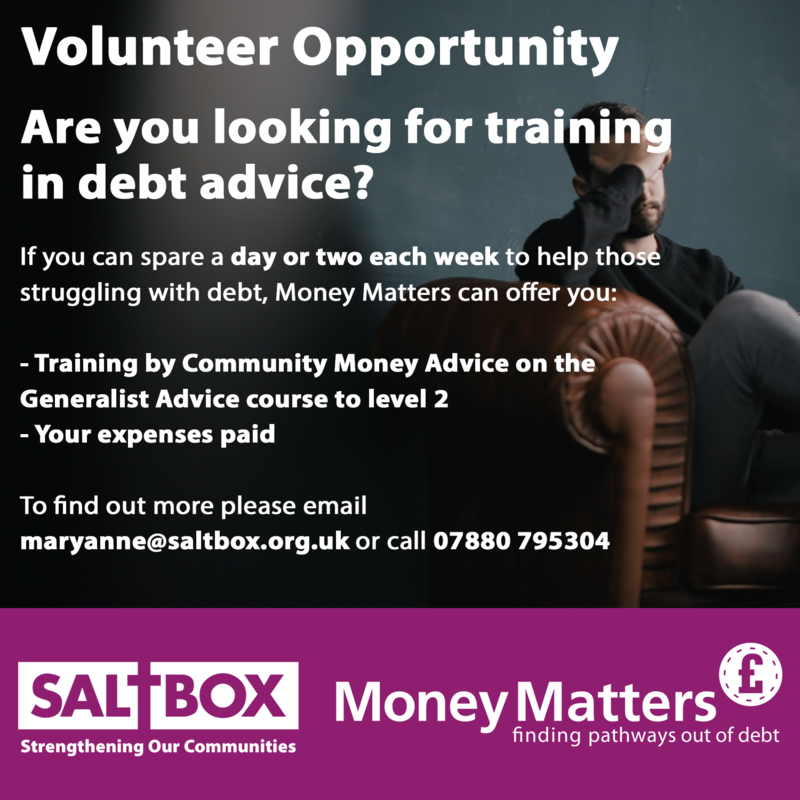 Find out all about the volunteering opportunities with Money Matters, and how you can get an all-expenses-paid qualification in Community Money Advice. Would you like to be involved in the rewarding work that Money Matters does? Do you have at least one day a week to volunteer to give advice at drop-in sessions around Stoke? Would you like to have a recognised Community Money Advice qualification fully funded while gaining incredible experience? The FAQs below will help you to determine whether joining the Money Matters team as a volunteer and becoming a part of these amazing everyday stories is right for you. We ask for applications from people who can commit to a minimum of one day per week, spread over two two-hour drop-in sessions. Anybody can apply, although references a DBS will be required. We welcome volunteers from all backgrounds; our clients are themselves varied as reflects the make-up of our city. We encourage applications from those who have found themselves in a similar situation and can readily empathise with our clients’ situations. What does a volunteer money adviser do exactly? You will work with our clients on a range of ways to help bring their financial crisis under control. Assessment: Firstly, you will assess what exactly the scope of the problem is and assess their income and expenditure. Debt management: You may also be required to negotiate with creditors on your client’s behalf to minimize repayments, or to have debt written off. Absolutely! You will initially be shadowing the senior adviser, Mary-anne, before you take on your own caseload. You will also be put forward for a Community Money Advice qualification to a minimum of level 2. The course is held on one-day training courses that you would need to be willing to travel to (to Liverpool for example), supported with evidence from your caseload. There will be an online competency assessment after levels 2 and 3 to pass. These qualifications are recognised by the Financial Conduct Authority. Will do volunteers get out of it? The adviser role is at the very heart of the service we provide. Essentially, you will be the directly helping people overwhelmed by their debt situation to get their life back on track and looking forward to the future. There’s a reason why people are described as ‘drowning in debt’ and you could be the difference between sink or swim!! By helping us provide this service you are also directly involved in reducing the need for foodbank intervention. A member of staff will always be available to give you continuous ongoing support, advice and guidance. Volunteering for Money Matters has been a fantastic experience; I have had the opportunity to enrich my Social Welfare course by marrying practice with theory and to extend my learning through access to wise advisors. I look forward to continuing to increase my knowledge further. My work with Money Matters has also given me a chance to gain a deeper understanding of the issues people face regularly with benefits and debt. It has been a great honour to have people tell me more about their lives and their experiences, and I absolutely love connecting with people on such a genuine level. From a personal perspective, volunteering has increased my confidence immeasurably. Mobility issues have sadly meant that I haven’t been able to work properly for some years now. Getting out and being in the community has given me back the chance to talk to lots of different people, and as a result I’m feeling so much more positive about life and the future. It has been a real privilege to be able to work alongside people from Money Matters, Saltbox and the Foodbanks, who have all been warm welcoming. I intend to continue my volunteering experience for a long time – I really thoroughly enjoy it! I volunteered for Money Matters as I wanted something more challenging than what most voluntary work offers. I wanted to be stretched, to learn new skills to be job ready after a long time at home looking after children. I already volunteer at the CAB, which is similar to this work in some ways, but this role required me to have more responsibility and a greater opportunity to work on my own initiative, which is what I wanted. I really enjoy the positive reaction of many Foodbank customers who are pleasantly surprised to find that we exist and are there to help with the financial problems that many of them have. Some of the conversations I have had have been enjoyable and interesting, and is a rewarding part of the role. The responsibility of doing a good job for people who are often vulnerable and not at their best can be challenging. I have learnt a huge amount of very useful information in training for this job, and I will come away with a formal qualification in Debt Advice which is bound to be very useful to me in future. A good understanding of benefits is really helpful for this role, as well as good numeracy and an ability to think on your feet. This isn’t suitable for someone who wants to get away from it all, but if you love a challenge then it’s a great opportunity to do something really worthwhile.